Tile removal involves using a specially designed blade combined with vibration from a jackhammer to get underneath the tiles separating them from the sub floor. All Stripped use this process to remove floor coverings off concrete, yellow tongue, timber floorboards and compressed sheeting. This process is effective on almost all tiled floor types with little sub floor damage. Tiles on screed – Screed is a mix of sand and cement and is used primarily to build up bathroom and laundry slabs and create fall to drains, Screed can also be used to create a level bed to lay tiles on. Most Slate, Terracotta or Marble tiles are laid on screed. The process of removing tiles on screed is much the same as basic tile removal however the process takes longer and produces a lot more rubble. Tiles on underlay (cement sheeting) – Many tiles laid on timber sub floors have an underlay. This means that the tiles are laid on sheeting that is fixed (either glued or nailed) to the timber sub floor. All Stripped remove the tiles, underlay and nails and leave the sub floor intact. However if the sub floor is soft or water damaged then some damage may occur to sub floor. Tiles direct stick onto timber – Tiles glued directly onto timber floors are very hard to remove. The type of tile, the glue used and even the type of timber sub floor affect the speed and outcome of the process significantly. This process can create minor damage to the timber sub floor depending on the circumstances, especially if sub floor is pine. 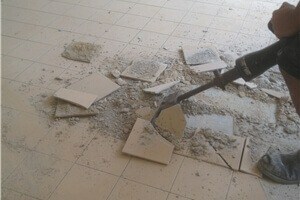 Removal of wall tiles – There are 3 main types of tile removal off walls. Tiles on plasterboard, tiles on cement sheet and tiles on rendered brick walls. 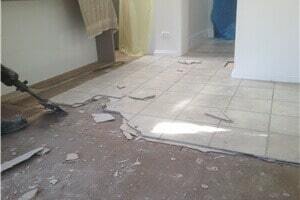 All 3 types of tile removal have very different processes and outcomes. Tile removal off plasterboard sheeting – Tile removal off plasterboard sheeting involves cutting out the tiles and plasterboard sheets. This is removed because the tile glue itself is stronger than the plasterboard and removing tiles only will result in damage to the sheeting. New Plasterboard sheets will need to be installed before a tiler can re-tile. Tile removal off villaboard or cement sheeting – Removing tiles off villaboard is a totally different scenario as the sheeting is much stronger. In most cases, this allows the tiles to be more easily removed off the sheet and the glue can be scraped off. Once this is achieved, new tiles can be laid. However cement sheet may also need to be removed if tile glue bond is stronger than the sheeting, causing damage to the sheeting. Tile removal off rendered brick walls – The third and hardest tile removal process is tiles on rendered brick walls. This can be very difficult depending on the condition of the render and the amount of (tile glue) used. This process involves using a small jackhammer to remove the tiles off the rendered wall. This can only be done if the render is hard and intact. If the render is soft and drummy, all the render needs to be removed off the affected area and re rendering will need to be completed before tiles are laid. Why choose All Stripped – All Stripped has been an industry leader in tile removal for almost 15 years. Our processes have been designed to be very effective and efficient whilst maintaining superior workmanship and service. This makes All Stripped ideal for commercial and domestic jobs with tight deadlines. All Stripped remove all rubble and waste material and use both dust extraction fans and drop sheets to control and minimize the spread of dust. Providing a vacuum finish and a clean worksite ready to continue with your renovation.